One of the Silverjet Boeing 767s. The current Newark Liberty Silverjet lounge, which is being replaced. 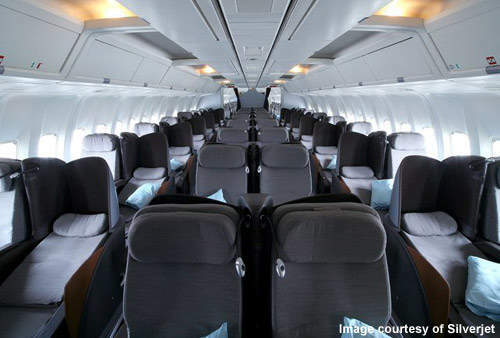 The Silverjet aircraft have 100 fully reclining 6ft 3 inch flat bed seats. Aswoon have provided some of the interior panels for the Silverjet Newark Liberty Airport lounge. Silverjet is a relatively new business-class-only airline based in Luton Airport UK, which offers a route between Luton and Newark in New Jersey. The inaugural flight of the new airline was in January 2007. CEO Lawrence Hunt said: “For too long, long-haul airline travel has been associated with hassle, disappointment and environmental damage. We’ve spent the past three years talking to customers and feel confident that Silverjet addresses their biggest concerns, making every journey as comfortable, flexible and innovative as possible. The airline currently flies twice a day between Luton and Newark Liberty Airports, and also daily between Luton and Dubai. New routes are planned for 2008 including destinations on the west coast of America and South Africa. The Silverjet lounge at Newark is currently a private room near door 12, level two, at the far end of the B terminal (a temporary facility). The lounge has silver and white ‘space age’ pod seats, and also runs a light buffet of finger sandwiches, snacks, fruit and beverages. Check-in for just carry-on luggage is 30 minutes prior to departure and 45 minutes for passengers with luggage. 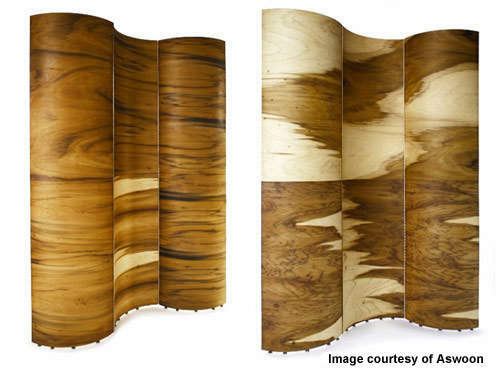 The lounge uses flexible architectural partitions (8ft x 6ft) from the New Wave Line, which were custom designed and hand made by Susan Woods design studio (Aswoon). Silverjet also runs private chauffeur-driven luxury cars, valet parking, helicopter transfer or complimentary station pick-up to bring the passengers to the VIP lounge. Check-in is possible 24 hours before arrival using a mobile phone or the internet. 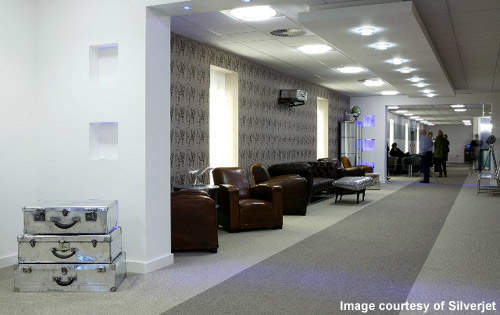 Silverjet also maintains a private VIP terminal building at Luton where passengers can relax and have meals prior to their flight (the departure terminal is about 100ft from the Silverjet terminal in Luton). Although Silverjet has only been running for just over a year, its success has shown that there is demand for business-class flying, which is more economical than those other airlines offer (fares are around $1,798, compared with $5,900 with comparable airlines, and are also carbon offset by the CarbonNeutral Company). The airline already has a specialised personal lounge for its passengers in terminal B at Newark but now has decided that facilities need to be improved and is fitting out a new lounge which will be three times the size of the previous one with additional facilities (bar, Wi-Fi, showers, business centre, massage, spa, newspapers and magazines, and television). The new lounge will be opened by the summer of 2008 and will also include a new restaurant for pre-flight dinners (Le Caprice, the renowned London restaurant will be involved in the restaurant in Newark and also a new in-flight menu), a kerbside entrance , valet parking and a concierge service. 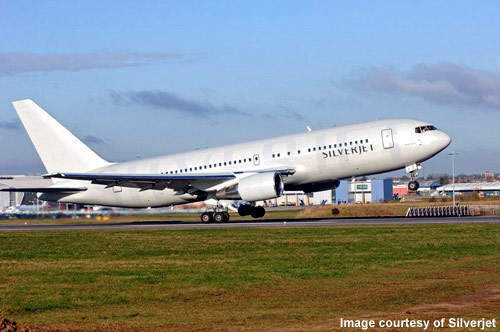 Silverjet uses Boeing 767s which are fitted out to carry 100 passengers (although the full configuration would be 300). All of the flights have flat bed seats which can extend to 6ft 3in long. Night flights see the plane designated as a quiet zone so that sleep time is maximised (no overhead lights, quiet breakfast serving and breakfast express for passengers who want to leave the flight on the go). The aircraft includes a portable in-flight entertainment system with special noise-cancelling headphones featuring US and UK television programmes and classic movies. The Silverjet flights also have a ladies-only toilet and one cabin staff member for every ten passengers. There is also a seat socket for laptop use.